The cake is fluffy…like a pancake, but the cinnamon swirl adds pretty marbling and buttery goodness…enough buttery goodness to satisfy old school Paula Deen. The frosting is just the right amount of sweet and creamy. Sidenote: This was actually made as a sample dessert…my amazing friends are getting married at the end of the summer and I am lucky enough to be doing their wedding dessert (cake wasn’t the only option). I followed this recipe… mostly. I didn’t have any cupcake liners, so I used two 8 inch rounds, I also cut the sugar in half, made a couple of ingredient additions and substitutions and used my own frosting recipe (which has drastically less sugar). The frosting recipe is a little more complicated than a regular frosting, but it is so worth the extra step or two. Trust me. Also, please see my notes on the frosting regarding quantity and sweetness. By popular demand, here is my version. 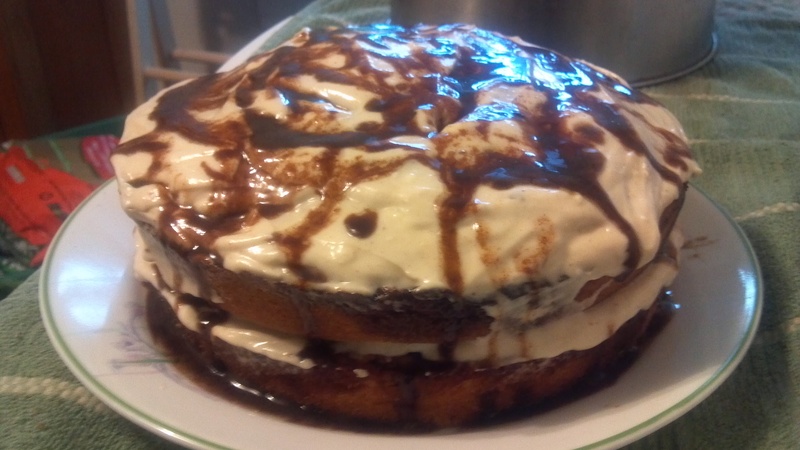 *NOTE: I followed the original recipe instructions for the swirl, but it made too much… so I am cutting it in half to save your insulin levels. *Note: This makes more frosting than you’ll need. I would suggest dividing your frosting into two dishes then adding the maple syrup and cinnamon to one, saving the other half for a different dessert (mixed with crushed up Newman O’s, or on red velvet cake? Anyone? )… OR you can just half this recipe…I know mascarpone is a bit fancy for a regular old cake, but trust me, it’s worth it. **Second Note: You’ve probably figured out that I am not a huge super sweet frosting fan..so adjust to your taste. Pre-heat oven to 350. Grease two 8 in round cake pans and set aside. Melt butter in a small-medium sized bowl over double-boiler. Once melted, remove from heat. Stir in cinnamon, sugar and salt until smooth. Set aside. Combine dry ingredients in a medium-sized bowl. Cream butter and sugar in a large bowl (I use my trusty pastry blender for this…you can also use a mixer). Beat in eggs, one at a time (If using the pastry blender, switch to a solid serving spoon or rubber spatula for beating). Stir in vanilla and sour cream. 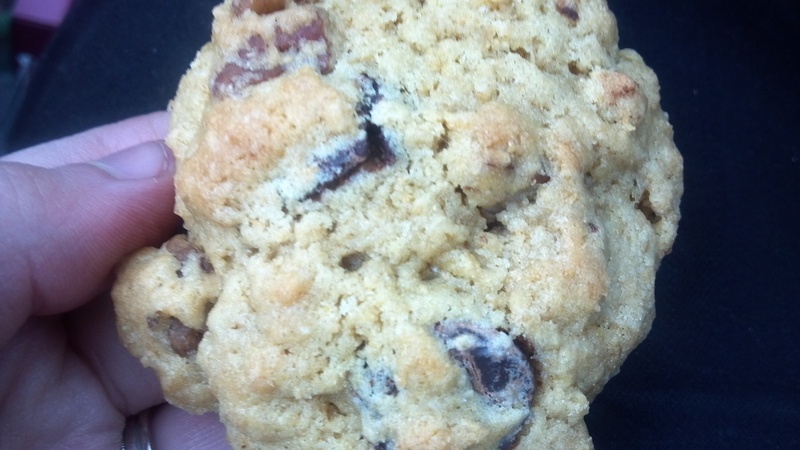 Beat in milk and flour mixture, adding a little of each at a time until all ingredients are well incorporated. This is going to make a pretty thick batter. That’s okay, don’t panic. Divide half of the batter into each of the prepared pans. Give the cinnamon swirl a quick stir and lightly drizzle 1/3 of it over batter. Divide the rest of the batter into each pan and, using a rubber spatula, spread evenly. Drizzle 1/3 of the cinnamon swirl over the top. Bake for 20-25 minutes or until a toothpick poked into the center comes out clean. Remove them from the oven and let them cool completely before frosting. 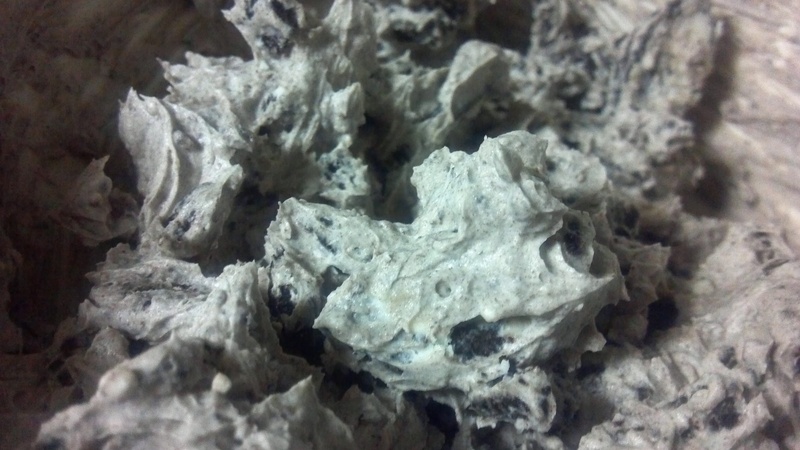 Whip cream to soft peaks, place in refrigerator/set aside. Place mascarpone and cream cheese in stand mixer with whisk attachment and beat on medium speed until combined and smooth. Beat in vanilla and add in powdered sugar, a little at a time, until completely incorporated. *Refrigerate until ready to use. *See note above. Right before frosting, add in remaining ingredients. 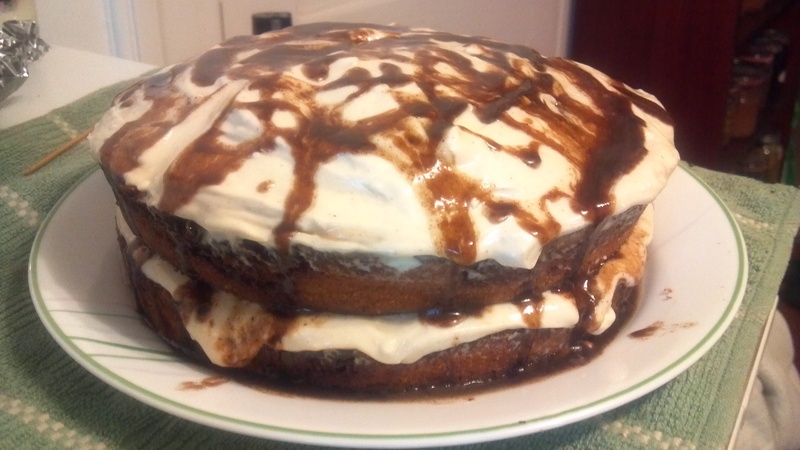 Frost your cake, top with remaining cinnamon swirl. I have a confession to make. I get weird cravings. I go through odd phases with food. I will obsess over one thing for a few weeks. Nothing can satiate me other than whatever food I am craving. I will eat only what the current obsession is (well…maybe a few other things)…and then, it will be over…I’ll move on. Lately, my obsession is biscuits. Super easy to make. Delicious whether on their own, with a fried egg or served along with a soup or stew, biscuits have taken over my kitchen and my life lately. It started when Ben came for one of our weekly lunch dates. He had taken some of our leftover turkey and mashed potatoes and made a creamy turkey/veggie/potato concoction. Then he made mini biscuits…it was like turkey pot pie.. but…not. Any-who, we had leftover leftovers so I decided to make more. 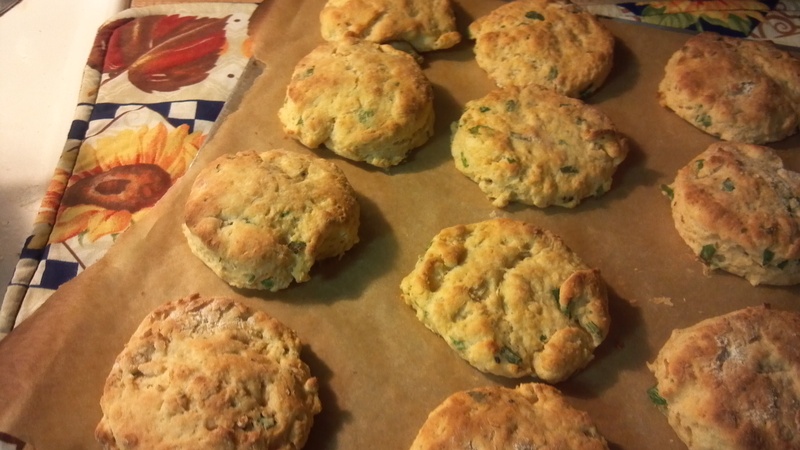 There is a biscuit recipe that I have been eyeing for quite some time on Joy the Baker’s site. and I decided to try it out…unfortunately, when I went to make it, I didn’t have buttermilk, so I used half and half instead. 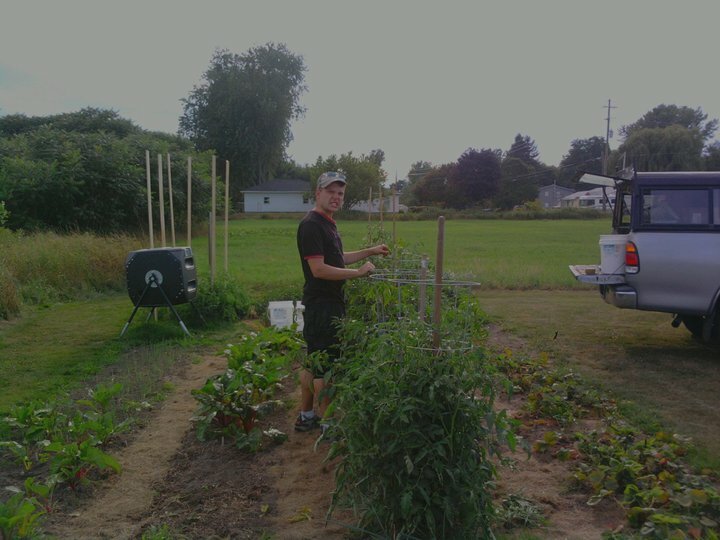 Luckily, the winter has been mild thus far, so we still have some scallions growing. The next time I made these biscuits, I made it my own. It was love at first bite (side note: I’ve always wanted to say that. haha!). I was hooked. 1 tsp. Smoky Paprika-this gives an amazing color! 3/4 cup to 1 cup (depending on how your dough blends) Goat Milk- it’s what I had on hand-feel free to substitute with buttermilk or whole milk. Place rack in center of oven. Preheat to 450. Combine your dry ingredients in a large bowl. 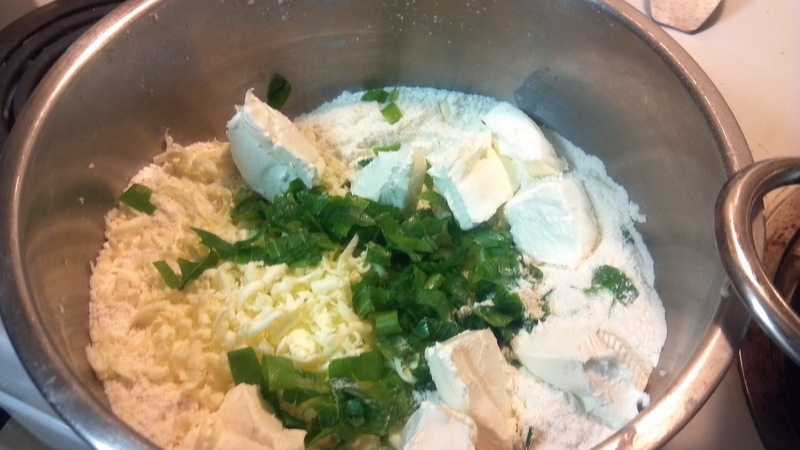 Cut cream cheese into chunks, add to dry ingredients. This was the first attempt... notice my DECEMBER SCALLIONS!!! Begin to cut the dough (I use a dough blender-as seen in this picture. You can also use a knife) until you get pea-sized crumbs. I love this. I use it alllll the time. (I still have some work to do at this point). Once your dough is starting to crumb, add in your milk. I used goat milk *which you can find at your local health food store/co-op. * It adds a nice creamy flavor-similar to buttermilk. You can also you use heavy cream, whole milk or buttermilk, whatever floats your little boat! I started out adding 3/4 cup. 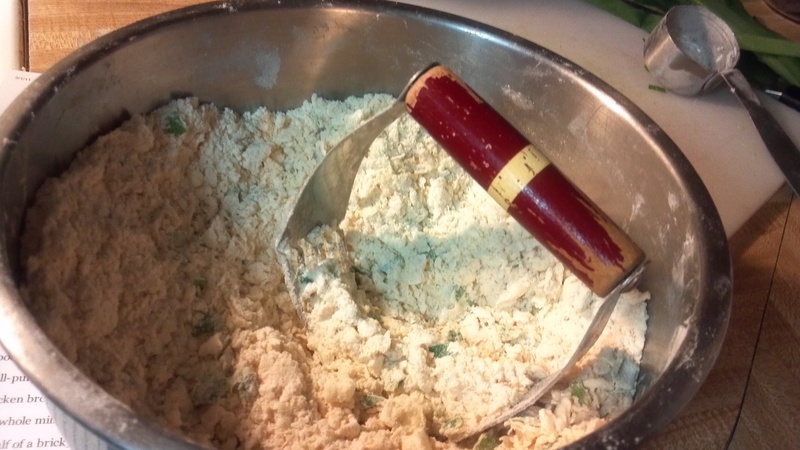 Using a fork, mix your wet and dry ingredients until the dough is moist-not sticky-and completely combined. I found that I needed to add a little more milk to it, do it slowly. Once this step is completed, put a little flour on your hands and dump the dough onto a lightly floured surface. Press it/knead it out until it’s about 1/2″-3/4″ thick. Use a biscuit cutter (or something else round-I used my walnut chopper-another super handy tool that I use ALL THE TIME! You can also use a drinking glass), cut the biscuits and place on a cookie sheet lined with parchment paper. You have no idea how excited I was at this point. 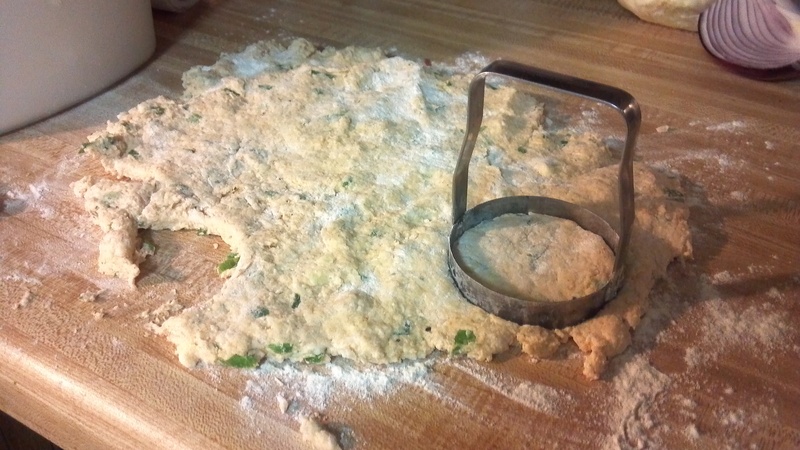 Combine and re-knead scraps, cutting until no scraps remain. Bake for about 8-10 minutes or until golden brown. Serve hot. Biscuits will last in a sealed Zip-lock/Tupperware for about 3 or 4 days. Makes about 16 biscuits. Boom. Done. Eat 'em up. Again, these will be great with a variety of spices. Just use what you have on hand and have fun with it.